This entry was posted on December 10, 2014 by Nicholas Lake | Marketing Manager. One of the main purposes of the roof is to protect against weather and to prevent the ingress of water. 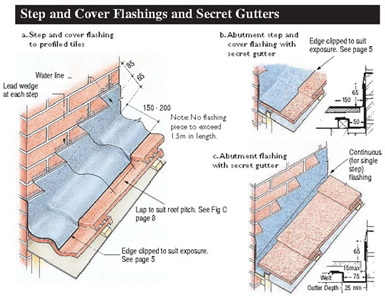 This lead flashing installation guide will answer some of your questions about lead flashing. Lead roof flashing is an integral part of any roofing structure and works to prevent the passage of water into the structure from a joint. Keep reading our lead flashing installation guide to find out more about lead flashing codes. Before lead roof flashing was available, a variety of different methods were employed to prevent the ingress of water, such as angling shingles away from the joint, placing chimneys at the ridge, and building steps into the side of chimneys to throw off the water. The introduction of manufactured lead flashing codes meant that it could be used to decrease water penetration at joints such as chimneys, vent pipes, walls that abut roofs, and window and door openings. Lead roof flashing with unique lead flashing codes can be exposed or concealed, and usually consists of a sheet metal such as lead, copper, or aluminium. It should incorporate expansion joints for long runs to prevent deformation of the metal sheets due to expansion and contraction, and should not stain or be stained by adjacent materials or react chemically with them. There are three main types of flashing that are typically used in roofing applications and are discussed in our lead flashing installation guide: Apron flashing, Chimney flashing and Step flashing. Apron flashing (also known as cover flashing) is the most common type of flashing used in roofing applications, mainly due to its versatility. 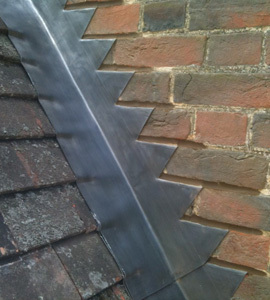 This type of flashing can be used on the front and backs of chimneys, abutting brickwork on flat roofs, or where a roof meets the brickwork of a house or outbuilding. It is also used on slate and tile roofs where they meet a wall or a porch, on conservatory roofs, and around bay windows. Step flashing allows a roof to abutt brickwork in situations where a lower height roof runs into a wall, a roof meets a chimney, or a conservatory roof meets the wall of a house. The ‘step’ refers to the pattern created in the lead by a series of cuts that allows the lead to penetrate into the courses between the bricks that resemble the steps of a staircase. The reason for going to the trouble of creating the steps is so the bricks can remain un-cut and therefore undamaged, while it is also aesthetically pleasing. 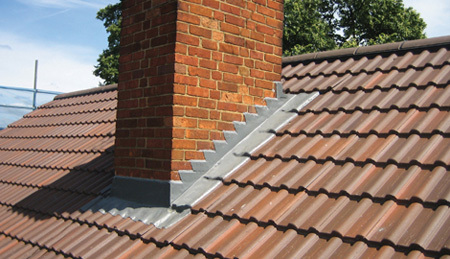 Chimney flashing specifically prevents water from entering the building at the point where the chimney meets the roof. Step flashing is typically used along the edges of the chimney stack. Lead roof flashing is usually made from code 4 milled lead, which is recommended because it provides a good compromise between malleability and resistance to fatigue splits caused by expansion and contraction. Code 3 lead, which is thinner and lighter, is used for lead soakers – these are the unseen waterproof sections that sit underneath tiles or slates. To find out more about how to secure lead flashing, watch the informative video below. Old brickwork – On older properties and chimneys, the brickwork can become loose or sandy, and the deeper you cut the more likely that the bricks will become loose. Windows and Lintels – the strength of the bond of the bricks in these areas can weaken, and easily become loose. Poor bricklaying – if the rear, unseen face of the brickwork has been left with gaps, removing 25mm from the front could cause weakness and make the brickwork loose. When it comes to how to secure lead flashing, old mortar can be removed with a small angle grinder or with a mortar raking tool. This process is often known as raking out or cutting a chase. The Chase Depth – This is the amount of lead that will poke into the gap between brickwork, normally a few mm short of bottoming out for ease of fitting. The Upstand or ‘Drop’ – The distance the flashing ‘drops’ down the wall to meet with the roof. The Cover – the amount of lead that will cover the tiles or slates beneath to make them waterproof, also known as the ‘overlap’. The height of the upstand or drop is usually 150mm, which is equal to two courses of brickwork, although it can be less if you are fitting the roof under a window, or for aesthetic reasons. You can reduce this measurement, for example to 75mm, but ensure that there are no other factors such as splashing from above, driving weather or snow drifts which could make this unsuitable. The measurement for the cover or overlap onto the roof is also usually 150mm, but again, if you are considering increasing or decreasing the measurement, you should take into account the pitch of the roof, weather exposure and aesthetics. Lead sheet for lead flashing should be no longer than 1.5 metres. If the lead is cut any longer it could lead to splitting of the lead work due to expansion and contraction. When fitting flashings they should overlap by a minimum of 100mm. This is a good general rule of thumb on how to cut lead flashing, but there are conditions where you may consider increasing this overlap, such as prevailing high winds, driving weather, and exceptionally high flashings where the overlap may become vulnerable to water creep. The most common method of fixing lead flashing is to make a lead bung or ‘chock’. This is made by rolling up a 25mm or less strip of lead into an oval shape just wider than the mortar chase you are fixing, then driving it below the surface of bricks to form a wedge. The alternative is to use hall clips or nylon flashing clips. These can be quicker and easier to use if you are installing a large run of flashings, but may also be more expensive than the traditional lead bung method. There are two methods of pointing the lead roof flashing, either by using traditional method of pointing with mortar, or by using silicone mastic. If you opt for using mortar it is important to make sure it reaches all the way to the back of the chase to avoid flashing leaks. If you decide to use silicone mastic make sure that it is suitable for use with lead, as some mastic can react adversely to lead over time. Finally, it is worth considering the lead roof flashing with patination oil. This will tone down the initial shine of new milled lead, and also protect against white staining left by running water.